Yes! For women with private insurance, we work with an insurance billing service to obtain reimbursement for you. Our practice will bill every private insurance carrier for the cost of global maternity services. Reimbursement is obtained with the help our biller who truly goes the extra mile for families, and can work to gain In Network Exceptions/Waivers (GAP) when necessary. Even if you have been told home birth is not covered, or only covered with a nurse midwife, families are still able to obtain coverage for home birth midwifery care. New provisions in the affordable care act mandate coverage for state licensed practitioners providing covered services. Private plans vary in coverage, and we can help you learn more about your coverage before you start care. For women on Oregon Health Plan, the complete cost of midwifery care is covered! Ash Johnsdottir is an approved OHP provider. You need to be enrolled on an “open card”, but we can help you do that! If you have questions about your insurance or want to know more, call (541) 908-9188 and let’s talk. A midwife provides health care for mother and baby. A doula offers emotional support & assistance during birth, but does not provide any sort of health care for mother or baby. Training to become a midwife takes many years of study and apprenticeship, while many doula training courses happen over a weekend. Both serve women during labor and birth, but have very different roles. What if there is a complication or emergency during the birth? Although midwives work to prevent complications, in some cases complications develop that necessitate medical care. We are trained in neonatal resuscitation and CPR, we carry IV fluids, anti-hemorrhagic drugs, and we don’t hesitate to transfer care if it’s necessary for safety. However the vast majority of women who plan to give birth at home will not need to transfer care. And the vast majority of the women who do need a transfer for medical care will not need an ambulance or emergency services. Example transfer scenario: The midwife arrives to care for a woman in labor. After assessing her, it is discovered that the baby has turned to the breech position. After the midwife and the family discuss the possible risks and benefits of delivering a breech baby at home, the family elects to deliver via a cesarean in the hospital. The midwife calls the labor and delivery unit to notify them of the transfer of care. Father drives, while the midwife helps the mother breathe through contractions during the ride. The midwife brings the complete medical chart and assists the physician by providing the mother’s history. The midwife remains with the family through the birth. After the birth, postpartum midwifery care starts and the midwife provides care for mother and newborn and helps with the special challenges of breastfeeding after a cesarean. I live in a small apartment, can I have a home birth? Absolutely! Babies can be born just about everywhere. If you have a space that is clean, safe, and warm, home birth is fine. Sure! Some families want the baby’s father or another special person to “catch” the baby. Almost always, your midwife can either step back entirely or help guide the hands if desired. Most babies just come right out! In rare cases, this won’t be possible because the baby will need special maneuvers to be delivered, and the midwife will need to step in. 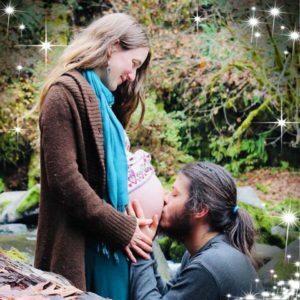 Is homebirth messy? Who cleans up the mess? We handle that! We’ve got a system to keep things tidy during the birth and clean any mess while you and your family rest afterwards. When we leave, we’ll start a load with any laundry from the birth, and take out the trash from the birth as well! You can trust that you won’t be left with any birth mess while you bond with your new baby at home.